I recently noticed that a good New York rye bread with caraway seeds is much tastier and crisper than a plain white New York rye bread. (Does anyone know why?) It got me thinking about caraway seeds. They are an important flavor addition to many German dishes and therefore also to German-Jewish food. When I was growing up in Washington Heights, my mother made sautéed potatoes with great regularity – probably three or four times a week. I have to assume that this practice arrived on these shores with her, and that is what she was used to cooking in Germany. Like most of my mother’s food, it was simple and delicious, relying on ingredients that make themselves easily known. She used a black enameled fry pan with tapered sides brought over when they immigrated in 1939. The pan would get a large dab of Crisco or butter, or both; the pan was heated and the previously steamed potatoes were then sliced and laid into the hot fat. The aroma of the butter signaled that these delightful potatoes were on the menu. If I was doing homework on the living room floor, I would head through the swinging door to the kitchen and check out the pan, maybe snitching a slice of potato. Mom tended to fry hotter than I do, so her potatoes usually had some darker and lighter spots, including some very crisp portions. She would add salt and caraway seeds somewhere during the cooking process. 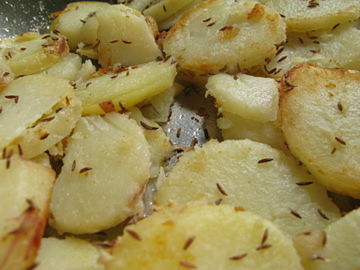 The seeds dotted the potatoes, making a very noticeable pattern which is appropriate because the caraway taste is a very distinctive characteristic of this dish. 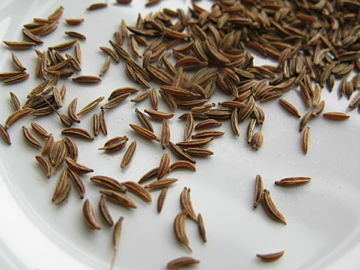 In Germany, caraway seeds are also often added to cabbage dishes and to sauerkraut, things I also remember from my childhood. Why, I wonder, is caraway, which is called kümmel in German, so popular? This spice, like so many, has a long history winding from one continent and millennium to the next. Think Stone Age, and Egyptians burying the seeds with their dead. It is related to other spices such as fennel, coriander and anise seed and this whole family of flavorings is considered to be carminative, which means they are soothing to the digestive system. It probably does so well in North-Central Europe because it grows well there, which I think is not the case with fennel and the others. It probably also has a calming effect when eating some rather heavy, difficult-to-digest foods. 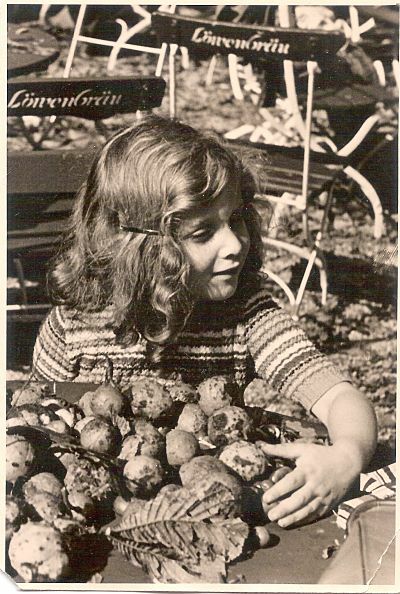 Here is a recipe for my version of my mother Erna’s roasted potatoes. I’ve swapped out her Crisco for vegetable oil, but they remain essentially as I remember them from my youth: both crispy and soft, slightly salty and filled with heady caraway notes. They are a wonderful accompaniment to just about any meal, but work especially well with schnitzel, roast chicken, or any type of wurst. 1) Steam or boil the potatoes until barely tender, about 20 minutes. Remove from pot. When cool enough to handle, slice into ½ inch thick pieces. 2) Heat the oil (and butter, if using) in a large fry pan. Layer potatoes into the pan and cook on medium heat. Turn frequently so they will brown evenly. 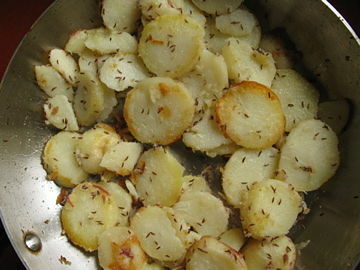 When they begin to brown, scatter the caraway seeds and salt over the potatoes and toss. Cook another minute or two. The potatoes should be gently browned around the edges. Eat hot. Growing up, I often ate the food of my two Jewish grandmothers (and my grandfather, but that’s another story). I loved eating at both households, though their foods were very different. I’m not sure when it was exactly, but at a certain point I realized that the food at Oma and Opa’s house, (Erna and Stephen Rossmer, my maternal, German-Jewish grandparents), was quite different than that at Nana and Zaidy’s (Ida and Max Gropman, my paternal, Eastern-European Jewish grandparents). Their food was unique, unlike most of the food eaten by other Jewish families I knew. 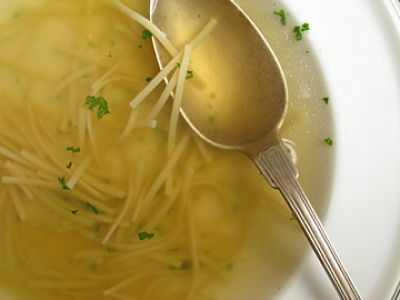 True, there was matzoh ball soup at both houses, but even the broth they sat in differed: chicken soup vs. beef soup. I wrote about my Oma’s beef soup – a beef broth, really – for The Jew & The Carrot, the food blog of The Jewish Daily Forward. You can read the article here (including the recipe for Beef Soup with Noodles). But matzoh balls are pretty much where the similarities both begin and end. I gradually realized that Oma and Opa’s food represented a special cuisine, one which was not well-known and was in fact over-looked. As is generally the case, the cuisine of Jews in Germany reflected the food that was available to them both geographically and culturally. German-Jewish food was essentially German food with a twist – a twist to adapt dishes to conform to kosher law. This may have meant replacing dairy ingredients with non-dairy ingredients, or cooking a dish in a slow oven overnight on Fridays in observation of Sabbath rules. But in general, the ingredients remained the same as those used by non-Jewish neighbors – the same vegetables, fruits, grains, and to a large degree, the same meats. But a cuisine is more than the sum of its parts, more than just a collection of recipes and ingredients. It is a shared experience and a shared history. It was this realization that inspired us – my mother Gabrielle and I – to investigate this topic. We decided to research this food and to reach out to others who grew up eating it – and perhaps still eat it today – as a way to preserve, share and document this foodway. We would like to hear from you – to try your recipes and hear about your family’s meals! We welcome your comments, questions, stories or recipes. While we are writing this blog in English, feel free to write to us in German and we will translate (Sie können in Deutsch gern schreiben. Wir werden übersetzen.). 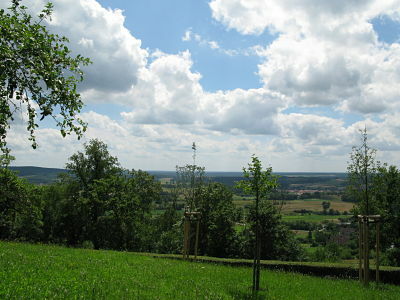 Photos, from top: Beef Soup with Noodles; Bamberg, Germany, 2011 (left: landscape, right: green walnuts on tree); our cousin Ann, gathering walnuts in Munich, mid-1930s.